A lot has happened since the last time I posted. I started working full time at OCAD University, heading up a new e-reserves system integration and cataloguing zines(!!). I left my long-held position at Broken Pencil magazine, which I thought would be a very painful process but was actually quite freeing, creatively. I did a number of other fun projects and events, but the biggest thing has been my book deal with ECW Press. I’ve never written a book before, but this October I’ll be completing the first draft of a book about Nicolas Cage. I’m back at the blog because I’ve been asked to take part in a “blog tour” where writers share their projects and process with each others’ audiences. Thanks to Suzanne Alyssa Andrew — who I recently reconnected with after working with her at Broken Pencil many years ago — for asking me to join this tour. We recently met up to celebrate and commiserate over the writing process, so it’s fitting that we should share the experience of this blog tour now. I’m writing my first book; a non-fiction book about the duality of Nicolas Cage. Cage is a divisive actor who audiences seem to love and loathe in almost equal amounts. My book is part of ECW Press’ Pop Classics series which is dedicated to looking closely at elements of pop culture. Other books in the series have and will include Teenage Mutant Ninja Turtles, Twin Peaks and the film Showgirls. 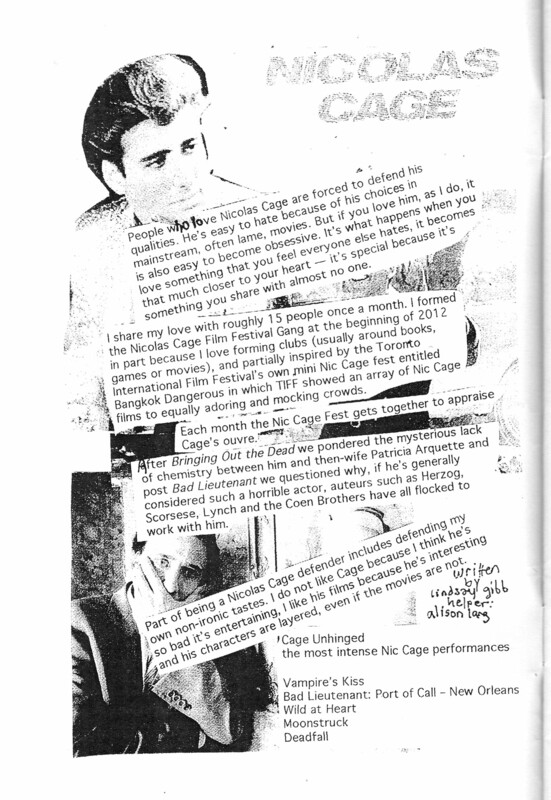 My book will examine the ways we look at Cage. It is at once strange and fitting that I’m now writing a book about Nicolas Cage. I come from a background in writing about film and filmmaking, but I have spent most of my writing career writing about independent arts and culture. So writing about a famous and very mainstream actor like Nicolas Cage is somewhat out of character for me. However, I’ve also been (very publicly) fascinated with Nicolas Cage for years. Since April 2012 (after TIFF’s retrospective of Nicolas Cage’s work ended) I have been running a film club with friends where we watch one Nicolas Cage film each month. Through curating and running this film club I have developed a bit of an obsession with Cage which is reflected online, where my friends have taken to sharing every Nicolas Cage thing they see with me (thank you, it’s helping with my research now!). 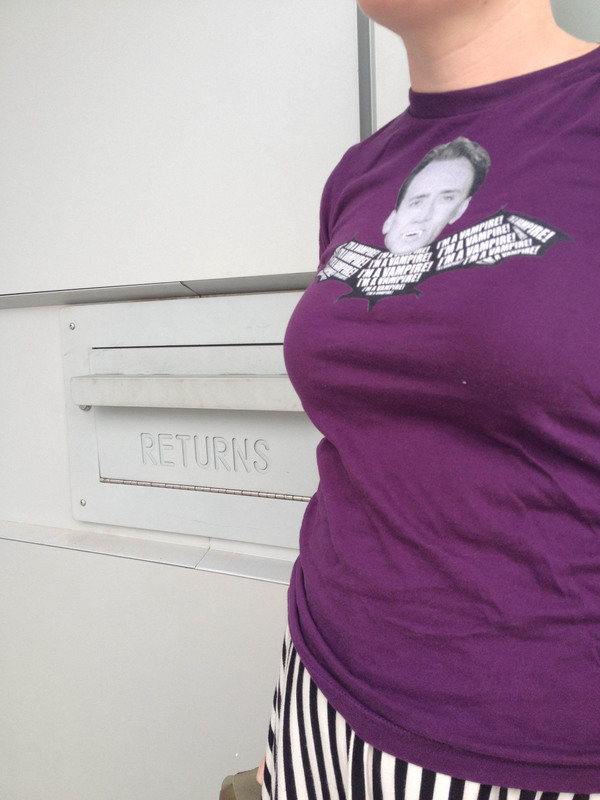 I’m still in the process of completing the first draft, but I’m looking forward to working with my editors Jen Knoch and Crissy Calhoun and seeing what it’s like dissecting Nicolas Cage with editors. It depends on what genre you think of. If you think of the recent genre of snarky articles about Nicolas Cage, it will differ by not being snarky. I will still be critical, but I’m not going to take easy (and not particularly thoughtful) stabs at the actor for his choice of roles (though I may make fun of his clothes a bit). My contribution to Static Zine. I usually make a schedule and then end up doing the same thing, which is struggling to focus all day and then writing all night. I can’t write during the day, particularly when there are other people around who I could potentially be talking to rather than writing. I’m a night writer. I get my best work done when the world seems to be asleep, my brain has calmed down for the day and I don’t feel like I’m missing anything. I’ve also learned that I’m good at writing on planes. I’ve done this once (last year, on my way to China) and the result was this article (which I think turned out pretty good). This worked because there’s really nothing to do other than sleep, read or watch movies (wait, those are all my favourite things to do…). So I guess I was motivated to write by the reward of sleeping, reading or watching a movie when I was done. And it was nice not to just do one of those things for the whole 17 hours on board.